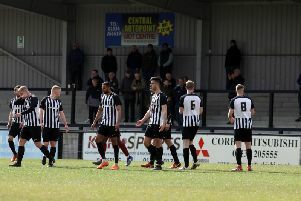 Cleveland Taylor looks to have played his last game for Corby Town. Steelmen boss Tommy Wright confirmed the experienced midfielder will depart Steel Park in a bid to seek regular football. In the wake of last weekend’s FA Cup defeat at Rugby Town, it was confirmed Taylor had stepped down as assistant-manager but he is now set to leave the club completely. Taylor captained the Steelmen to their stunning Southern League Premier Division title success during the 2014-15 campaign and also wore the armband in last weekend’s loss at Butlin Road. Wright said: “Cleves and I had spoken ahead of the game at Rugby. He stepped down as assistant-manager because he wants to focus on playing. “He wants to play regularly and he knows that is something I can’t guarantee him. “I gave him the captaincy on Saturday because if he was going to bow out then he deserved to do it as a leader. “We have spoken again and it’s probably the right time. “He’s done amazing things for this club and for me as a friend and I will never forget that. “He has been a credit to himself, his family and a figurehead for the club. “But he wants to be playing regularly and he needs to look elsewhere to make that happen. “And it may not be the last change we see. The Steelmen, meanwhile, have now confirmed that they will play current Evo-Stik Northern Premier League Premier Division leaders Buxton at Steel Park next Saturday (September 17, 3pm) following both clubs’ exits from the FA Cup last weekend. Corby’s home fixture against Rushall Olympic has also been rescheduled for Wednesday, November 30 (7.45pm).